In looking for ways to use a Betty Crocker sugar cookie mix that I found in my pantry I came across a recipe for Triple Berry Cookie Crumble on the Betty Crocker website. Although it sounded wonderful with blackberries, blueberries, and strawberries, I decided to use rhubarb from my garden along with strawberries. This was a big hit at our house. The cookie crumble topping was so good paired with the classic combination of strawberries and rhubarb. So quick and easy, this is a recipe that I look forward to trying with many different combinations of berries or fruits. An easy crumble recipe using a sugar cookie mix. 1. Preheat oven to 350°F and spray 2-quart glass baking dish with cooking spray. 2. Mix 1/2 cup of the cookie mix and 1/2 cup sugar in a small bowl.3. In a large bowl toss together strawberries and rhubarb then sprinkle the sugar and cookie mix mixture over the strawberries and rhubarb and gently toss until well coated. Put fruit mixture into baking dish.4. In a medium bowl, mix together the remaining cookie mix and cinnamon. Cut the butter into the cookie mixture using a pastry blender or fork until mixture is crumbly. Sprinkle evenly over fruit.5. Bake for 35 to 40 minutes or until the topping is lightly browned and the fruit is bubbly. 6. Serve warm or at room temperature. Serve with ice cream or whipped cream if desired. Sounds and looks wonderful Jill, I love the idea of doctored-up sugar cookie mix! Oh, yeah, this is a winner! Fabulous combination of fruit (wish the family liked rhubarb as much as I do! )...and fun, delicious short cut! Ohh this sounds awesome..I would love to try it one of these days:)) Thanks for the recipe, I love your photos!! Yum! It looks divine and it takes so little to make! I have never cooked with rhubarb before, yet I love it! I should really start! Great post! This looks just amazing! Classic combo, so good. Here's an irony of living in Israel: strawberry season and rhubarb season don't co-occur! I froze some strawberries and am waiting patiently for rhubarb so that I can still enjoy them together. Looks wonderful! Love this classic combination and the cookie- crumble is really enticing. Perfect combination of textures. Love it! Everyone is working with yummy rhubarb, I need to find some. This looks really good and so simple. oh delicious! I need to start baking with rhubarb! oh this makes me want to start baking with rhubarb -looks great! The streusel looks so gorgeous! Just stopping by to say thank you so much for linking up to our Family Favorite Recipe Round-Up today! We'd love to include your recipe (and any other you'd like to share) in an upcoming Gooseberry Patch cookbook. When you have a moment, would you mind stopping by our website and sharing it with us there? Here's a link: http://bit.ly/GBPsharearecipe Add the code RRU-FF to the Special Code field and we'll keep an eye out for it. :) If it's selected for publication, we'll let you know, and you'll receive a free copy of the cookbook too! Thanks again for sharing on our blog today...we appreciate it! 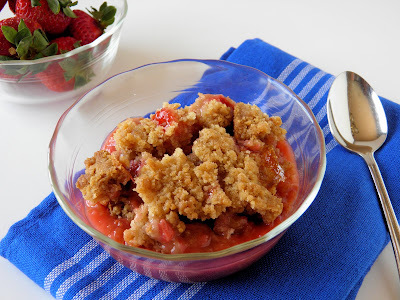 Love your strawberry-rhubarb cookie crumble easy and yummy recipe. It sure is a winner, and would be nice to add a scoop of vanilla ice cream to it. oh, rhubarb season, love it, so many delicious treats, just like this one. Jill, This sounds divine! 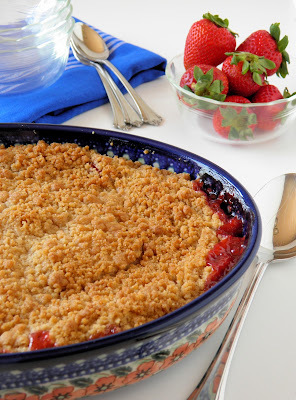 I love the idea of using sugar cookie mix in this crumble...I can just taste it now! Thanks! My sister made something very similar a couple days ago...it's so nice to have a sister who makes desserts for me (ahem, the family). I love crumbles and your looks delish. Thanks! But I promise to LOVE the next recipe you post! First time visitor and wow! Your food looks amazing and your photographs are good enough to eat!